I used to live in Benfield Crescent just off Foredown Drive which is to the far right end of the photo. I went to St. Nicholas Infants School at Southern Cross form 1949-51 and can remember those steps from the Old Shoreham Road into the Rec. They were however gated off, as the steps had all broken up making them dangerous to use. Anyone remember when they were actually removed? What about the large concrete water storage tank in the middle of the Rec? I used to walk along the top of the rec from the corner of Boundary & Old Shoreham Road to Portslade County School for Boys. This is just past Benfield School which I also went to. I remember those were what we called Goosegog trees – rather like Kiwi fruits. They were yummy – but now I wonder what the lead in the fumes did to them. My cousin Kenny Edwards lived in one of the houses in the far left, it had a long set of steps up to the front door. Cannot remember a tank – but I’m talking early 1960s. Chris, what about the next set of houses further to the left of where your cousin lived, they were terraced, see the link… http://www.multimap.com/s/SvSbXPjQ one of the girls from the Infants School lived there, she was Georgina Pennifold. One day there was a small fire in her house and I remember feeling so sad for her when she came to school. I like to be able to add her to my ‘School Mates’ list. Again I’m talking 1949-51 era. Any bells ringing? Chris, that map link should have been… http://www.multimap.com/s/TqNROPec The houses are to the east of Selaby House. Yes you are right – a couple of hundred meters further towards Shoreham. They moved to Franklin Road next to the Cinema and we moved to St Andrews Road. I loved Benfield School but cannot remember going there. I remember Portslade County School for Boys though I never was told it was a reform school. Chris, I cannot make out if the houses to the far right are south or north of the Old Shoreham Road. The reason for my interest is that my grandfather Reginald Barnard built a house (nos 197/199) on the edge of the brickfields, next to the rec, and it was completed before WW2. There is another good picture of the “rec” in the 1920s in the James Gray collection at http://regencysociety-jamesgray.com/volume38/source/jg_38_019.htm. I lived at no 199 as a child. There is also a very good aerial shot which includes Victoria Rec in around 1946 at http://www.geog.sussex.ac.uk/grc/info/sussexairphotos/1940/18-5040.jpg. You can clearly see the water tank. Also at the back of 197/199 you can see the roof of my grandfather’s workshop where he used to make staircases, window frames, etc. The main part of this blew down in a storm in the early 1950s. The rest of it finally collapsed in the late 1980s and has been left as a pile of rubble, ever since. No – I was born in 1948 and we moved to Portslade in 1956 – Did 11+ in 1959 at Benfield. I got the time line wrong – first Crown Road then St Andrews Road and finally Old Shoreham Road.I used the map and saw that the golf links opposite that house have completely gone. Shame – you could walk to the Dyke through there. Paul, all of the houses in that photo are on the north side of the Old Shoreham Road. The house that your grandfather built was just slightly west of Foredown Drive and on the south side of the Old Shoreham Road. There was a gap between the ‘Twitten’ that went past Benfield Primary and down to Victoria Road. Your GF’s house would have backed onto the Southdown Motor Works yard in Victoria Road. Going west after your GF’s house was the Rec. and then about ten terraced houses leading to the sweet shop at Southern Cross. The water storage tank in the Rec. isn’t on the early photo in the James Gray collection. I was told that it was built during WWII. I never did see water in it from 1949 when I used to walk to the Infants at Southern Cross. About 200 yards west of Foredown Drive, in one of those larger house, lived the Powell family. They owned a butcher’s shop. Chris, I assume you are referring to the Pennifolds who moved to Franklin Road. If so, do you know which school she attended as I just can’t remember her at Benfield Primary? Keep in touch with Steve Giles out there in B’ton & Hove. I lived in Glenelg, Adelaide for a year and there was also a Brighton and Hove just up the coast. Chris Edwards – I feel as though I ought to know you, as our histories seem so similar. I was also born in 1948, we moved to Portslade (from Brighton) in 1958, when I went to Benfield school and we lived in St Andrew’s Road. I was in Miss Belinfante’s class at Benfield. Later, in the early 60s, my friend Jackie and I used to hang out with other young teenagers in the Rec in the early evenings, by the swings. Just innocent talking, chewing gum and maybe an illicit cigarette or two in those days! I spent all my time at the rec in my younger days.There was indeed a water tank on the north side, it was brick built but I am not sure what it was there for. It was always fenced off and forbidden to enter, although we did to collect newts and tadpoles. The east end of the rec used to be a dip which housed a football pitch. This was filled in and was used as a groundfill site for a time which levelled out the area to what we see today. There were two sets of steps on the north side leading to Old Shoreham road and there was a driking tap at the foot of one. There were two shelters one of whch is now used for tool storage. The other, now no longer, was half way across near where the childrens area now is. The rec.. memories come back of a long swing that several kids could sit on , with one on each end working it. A roundabout, that in my teens I fell off. A slide and I recall the shelters, and a dim memory of the landfill. The first shop opposite the infants school, was a bread shop with a huge brown loaf of “Hovis” on the side wall, we could see it from the boys playground of the junior school. The sweet shop was next to the bakery. So many memories, what of the cattle arch, under the railway line, just along from the rec, I was so scared to walk through there. What about the old Star Laundry! I can remember climbing over the fence at the rear end of the Southdown bus works to get the ball bearings, then use them to play marbles. I always thought that the concrete pit in the park was the remains of a gun enplacement. And of course Fryco was always good for fire wood. Happy days. There used to be a plastics factory, we used to go up the side of it and help ourselves to old bits of bakerlite, I can still smell the plastic - wierd! That sweet shop you are on about, I can still picture the old lady that ran it, and the bell that rang when you opened the door. There was another sweet shop opposite the Ronuk Works you could get a penny glass of lemonade. Jack Tullet on his bike selling winkles, and nice they were with vinegar. Never see a rag and bone man these days, or the old French onion Johnny that used to come around. I was picked up by the truant officer down there during the war, I did not go to school as I wanted to go on the Merry-go-Round. Tell you, Mum was not happy! Don’t mention Selaby House! I remember sitting in the dentist’s waiting room listening to the cries of the poor blighter in the chair and the sound of the dreaded drill. I get a cold chill when I see the place even now. Another time I had to walk round with marbles between my toes for some unknown reason also do exercises for being round shouldered. Luckily I turned out OK in the end! The rec always brings back happy memories to me even though it’s altered so much now. I know just how you felt about Selaby House Den, the cries you heard were probably mine. I hated the place, I’ve had a fear of dentists ever since. I also remember Selaby House after trying to blow a gas-filled football up and waking up in the middle of having a tooth removed. I also remember the Powell brothers as I lived in Foredown Drive - went to Benfield School then to Mile Oak School for Girls. I think I might know you Tony from 1953 at the girls school. I now live in Italy. My sister Susan went to same schools 5 years after me. Selaby House, frightening place for little children. I had to visit daily to have my ears syringed out, prior to tonsil surgery. Luckily did not attend the dentist there, but in Hove. I recall the gas filled ball, yuk to this day. Just along from Selaby on Old Shoreham Road was a doctor’s surgery, had my smallpox jab there. Yvonne if you met up with other young teens in the Rec mid fifties, chances are we met also. I know Tony Clevett from working at the Southern Engraving in Upper Portslade, we met up again in 2008, neither changed or aged! True in your case only Bonny and Yvonne, you always were a stunner. This picture brings back happy times. I lived in Victoria Road and the park was where I spent most of my young days. Yes in the fifties. I am new to this site, and it’s lovely to reminisce. I remember Selaby House- what an awful place. I wonder if any of you remember me, Maureen Cannons. I had a sister Joan and a brother John. Hi Tony, you made my day beginning to feel the age bit especially after going down memory lane. Do you remember the fleapit cinema in North Road? I think it was one person to take your money and the same person showing the film. The seats in the back row which had no arms were in great demand. I also remember the pie lady in a green wagon parked outside Portslade Station, trying to get on a bus with an innertube without being seen, spending all the summer hols down Hove Lagoon beach rain or shine. I remember some names: Micky Gobel, Syd Penfold, Raymond Willard, Bobby Brazier and Charlie Felps. Also the tinhut played the best rock and roll music, having to sit up by the water tower at the top of Foredown as the only place to get a signal for Radio Luxemberg. I could carry on now the brain has clicked in. Hope all you Portsladers had the same good memories like I have, keep them coming till next time. Hi Yvonne, yes the Pavilion cinema brings back memories as does the Rothbury, sadly both no longer. Most of the lads you mention are still around. Portslade rec was the place to hang around, always keeping an eye out for tall girls with Great Dane dogs in case we were licked to death, (dog, not girl). Sadly the Portslade that we all knew is no more but the memories are still as strong. Christmas Day – 2011, Aberdeenshire. Selaby House? I remember biting on the rubber bung to keep your mouth open, then the Gas Mask was put over and you’d count 1,2,3…………. away. I remember swimming the Channel in one of my dental dreams. Gas was great. Then some #$*& invented cocaine and a needle to put it in with. That was the end of dentistry for me, absolute murder. Mid 195’s in the Rec. There was a girl there who had double calipers on her legs but that didn’t stop her going on all of the amusements and swinging as high as the next one. Eileen rings a bell. That Water Tank. 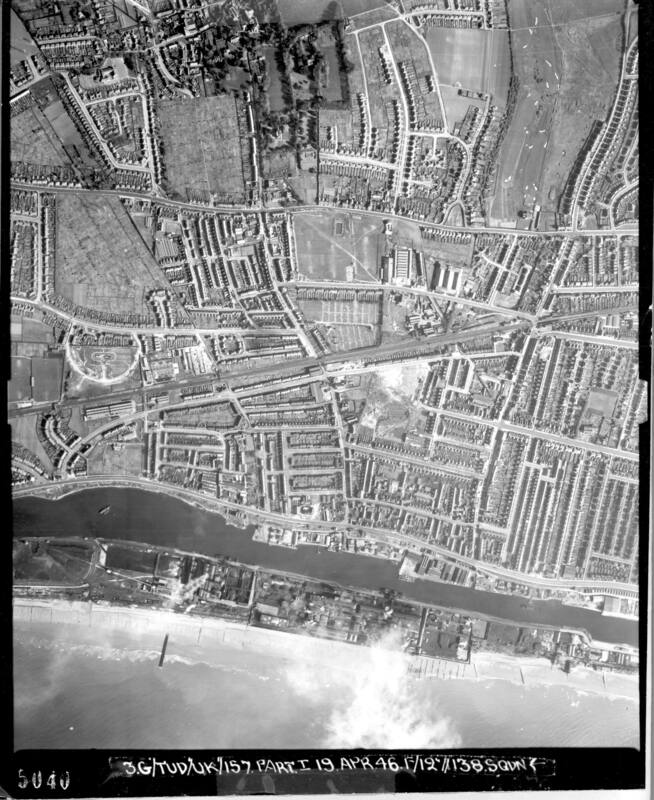 Here it is taken about April 1946. http://www.geog.sussex.ac.uk/grc/info/sussexairphotos/1940/18-5040.jpg Just cut ‘n paste this URL into your web browsers address line. This next URL will give you a wider selection of Sussex…. http://www.geog.sussex.ac.uk/grc/info/airphotos-historic/1940/index.html?ZOOM=e+GPSX=534500+GPSY=129500 Just click on the green aircraft that is nearest to your desired point. It does take a bit of getting used to and moving around, plus places look so different from the air. Hi!! With reference to the green tool shed in the south west corner of Victoria park – it is construcred around one of the old shelters, and as a past park’s employee, the last time I was in that shed you could still see the old wrought iron work that formed the frame of the original shelter and if my memory serves me correctly some of the stained glass is still in place around the top of the frame. If the shed is still standing, the interior should be a listed structure as part of the history of the area. 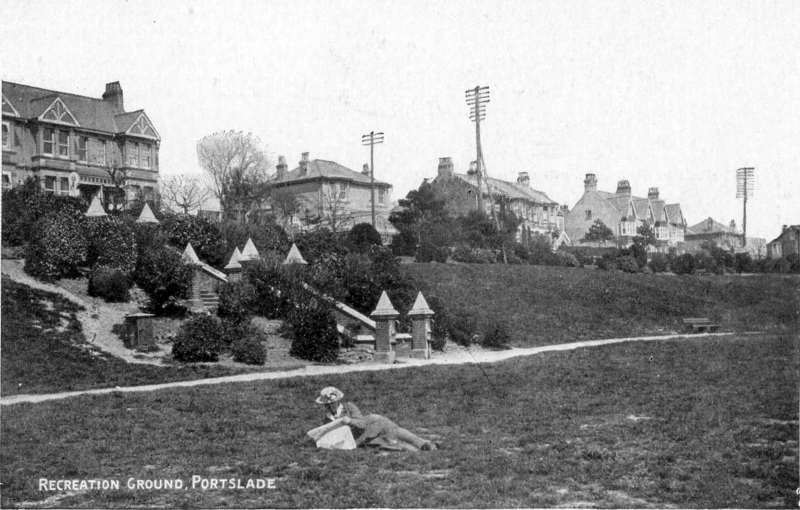 Just a quick note regarding the date of the photo at the top of the page of Portslade Rec. It has come up again on eBay and apparently the postal date is 1919. Hello Maureen, I well remember you and Joan and also can picture your dad Frank I think? Kenneth Eade lived to the west of you with the Goldsmiths, Arthur and daughters Julia and Pauline at No. 92. I lived at 94, with my Uncle Bill next door. Jack Steyning was at 98 with Arthur Walder next door, his son Roy lived at 100. He now lives in Bristol and we keep in touch. Julia and her mum dropped in to see my mum (and their old house) around 1980. You probably don’t remember Chris Cotton, who lived at 120. He now lives in Auckland and we reminisce on the phone quite often. Portslade rec has very fond memories for me too, and I’m surprised no one has mentioned the rec keeper by name of Dando. Think he lurked in the cricket pavilion waiting for miscreants. He was rather elderly and somewhat terrifying to the kids, though he could manage to clear a park bench in one stride when chasing us. That was in the 40s and early 50s of course. Victoria Road was a marvellous place to live, with the rec in front and cemetary behind. I vividly remember the church bells from the chaple ringing out on Sundays. Always hot summers in those days, my bike tyres would stick to the melting tar on the road. Barry (Ottawa). Oh yes, Dando was terrifying alright. Often the cry would go up ‘Run – Dando’s coming’ and we did. I lived at 108 Victoria Road with my parents. I recognise some of those names Barry mentioned, my Dad also Ray played cricket on the rec and looked after the pitch in his retired years. Can Yvonne or anyone elaborate on the memory of the Pie man/lady at Portslade station? I’m not sure if this has been asked before but when was that large concrete ‘water’ storage tank built in Portslade Rec? I remember it from the late 1940’s when walking from Foredown Drive to The Infants School at Southern Cross. It was always fenced off as it was about ten feet deep I’d say. A friend reckons it was filled in around the mid 60’s. I was told it was for water storage during WWII. Click here to see it in 1946… https://www.sussex.ac.uk/geography/researchprojects/sussexairphotos/1940/18-5040.jpg You’ll have to ‘slide’ around to find it. Chris. The pie lady was named Maud and she lived just round the corner in Links Road. She had long dirty fingernails. I don’t think she would get past health & safety these days. The price of a pie sixpence and boy did they taste good!